The South Pole: Solo but not Alone: Day 28: Freedom, capitulation and prisons... A different day! Howard Fairbank, taking on - solo and unsupported - the 900 km skiing challenge on the coldest, driest, highest, windiest continent on Earth. Day 28: Freedom, capitulation and prisons... A different day! Yeah, a low distance day, just on my 'minimum acceptable'! Only 25 km done, but 'All OK' in today's capitulated paradigm. As I said in yesterday's post, I knew I was caught in this 'can't ski easily, and can't walk easily' terrain position, and was needing to change my paradigm. The terrain largely remained the same so I was initially restless, constantly thinking of changing between walking and skiing, not a good place to be. After an initial -23C and moderate crosswind, it went warm and still, cloudless sky, and just a PERFECT day. A real day to be soaked up and enjoyed, and really appreciate the luxury of the pure mind space this ice nothingness can give. To enjoy the journey! After seeing 3.1 km for the first hour, I sensed that new paradigm better be developed quickly, or else I was going to be one hellluva frustrated guy by the end of the day! You may have noticed that I use the words "capitulation" and "prison" a lot? They are strong, motive words, and ones that lie on the other side of the line from Freedom. Freedom is something I value hugely, and find fascinating, and basically in 2004, when I left Sydney, the business world, and shed all my possessions, to start the 'Simply Adventure' life, it was largely about going to find myself and explore Freedom: how it works, what - if anything - defines the limits, and how I could find a life that had maximum freedom, but was also holistic and meaningful. I am pretty confident, and hopefully you don't see it as arrogant, in saying that over the 7 years, I pushed the limits, and went where few have gone, in terms of experiencing close to total freedom. Total freedom being the ability to act, speak, and think without restraint. I had perceived that 'we', all / most people have capitulated freedom, have accepted the constraints, restraints and perceived limitations in their life situation, and in doing so create a 'prison' where there no keys; the prison warders are non-negotiable, and so there is no way out, so one then capitulates to accept that IS life and one then makes the very best of it and the prison isn't even recognisable. In fact it becomes very cosy, a source of great social belonging, and meaningful purpose. One even goes as far as being deluded into thinking that one has 'total' Freedom. That's what I call the capitulated freedom. Prison is a harsh word, because most of us find our 'prison' a pretty OK 'place' to live. By not fighting the restraints / constraints, one is not restless and searching for more freedom, but rather fully involved in making the 'Now' of the prison work and deliver contentment. I think Patrick, in one of his comments on the blog, referred to the Buddhist approach which says something along the lines that life IS suffering, and the sooner we accept that the more content and less expectant and disappointed we will be... In my view, that's supporting what I say above: life is like being in a 'suffering prison' - just capitulate and accept it, and it won't feel like a prison, you'll be free! So, back to here on the ice in Antarctica... Am I in ultimate freedom, or a minute, solitary confinement cell of the worst degree? Well here on the ice it is quite a small 'prison' for me, even in the nothingness of Antarctica. I'm pretty much restricted in what I can do, choices, etc. Yes I can behave speak and think almost without constraint, but essentially it's a tight prison; one of every day involving 11 hours. Hard labour too! The freedom comes in me voluntarily deciding to step in to explore the Solo to South Pole prison and to experience its restraints! To do this, I need to go through a serious capitulation process, before I can thin k it enjoy my prison. I have to accept that that's what life is, there are no outs, no warder with a key, I'm in for 35+ days, and that's non negotiable. Once I accept that I become pseudo free, and am on the path to contentment in my new life. That's why I felt so unneedy at the halfway point, in my restrained world I had everything! Yesterday, the very slow terrain made my prison get even smaller, and so today I needed a new paradigm of capitulation to deal with its tighter constraints, or go mad! Some may think that this posting confirms: "I went mad!" On this blog, everyone has Freedom of opinion! Well, the way I capitulated was to take away my 30 km/day goal, and to just accept whatever distance I do, but for me to get FULLY into the Now of being out here in this special place. And so that's what I did: appreciated the sastrugi, lots of photos, stopped often and took in with awe the 360 degree 'horizonless' space, and spent quality time articulating these freedom/prison capitulation thoughts. In my book that is STILL 'work in progress', Freedom and these concepts are given very REAL practical support, as adventure by definition creates this extraordinary combination of freedom, and yet a necessary, daily micro prison. In conclusion, I believe we all need 'prisons' because that's where significant things get done, relationships for me, and huge personal learning can take place. But how can one get Freedom as well? That, to me, is the holy grail of life, and I've tried to get the unlikely combination through the 'Simply Adventure' life philosophy which involves regular breakaways from true freedom into voluntary but highly constrained adventure 'prisons' like this 'stroll to the Pole'. And finally, I guess I read many of your comments relating to my adventure 'inspiring' you to make some change, embark on your own South Pole.... Yes, that's making the decision not to be content with your 'prison' anymore, and to go explore a bigger and less constraining one, one that takes you closer to REAL freedom.... It needs courage, belief in yourself, and a vision / dream for more out of life... Not really a Buddhist approach, and I'm not saying it's right or wrong; your 'gut' will tell you what's right for YOU! Given what I now know about myself and have experienced in the last 7 years, I'd be 'violently angry' if either the 'dream thief' had come along and taken me off this planet before I could have experienced it, or I was still forced to be living a 'normal' life in Sydney, or wherever! That's just my perspective in the context of ME and all my baggage. How this all applies to you is for you to either instantly dump or work through for your life choices. Damn, if I had been more end goal focused, marched for 12+ hours, I'd only have 190 km to the Pole, instead of the 195km that I do have! I hope you enjoyed the different day too...? It's a beautiful, warm -12C outside, TOTAL silence, quite special... The tent will be warm for sleeping tonight. Oh Howard, you made me laugh and I don't think you've gone mad, I think you are a deep thinker. Thank you for sharing all that you do. I was happy to hear you found joy in the things around you today, good to hear you sounding more upbeat. I love your opinons and then your humility in claming the concepts for yourself and stating that they may not be for everyone. Each person is truely on their own journey, aren't they? Your ideas make me check my beliefs, and that's always good! Contineous improvement. Now, what I would give to see that horizon! I live in a valley with trees hanging over like a canopy. It's beautiful here, but I love BIG SKIES too. Thank you for the mental picture...I can see it! Sandy T.
The difference between Pain and Suffering is that suffering is when we are in pain without knowing the cause (living in ignorance of our condition). It's very common - highly prevalent actually :D.
Mellow out if you can and endure the view, it's almost over and I bet you'll miss it when it's done. I read EVERY word and LOVED it! When is your book coming out? I'll be there to buy it.....missing that extra 5?..it was worth it (me being selfish) just to get your next layer of musings.....I can't wait for what tomorrow brings. Santa? Godot? nah..I'm waiting for Howard! Howard, my friend, the trials and tribulations that you have taken on yourself may often take you to the breaking point. The key is to give meaning to your pain. I say, regard this as an expiation and a penance, that your newly emerging, affirmative self requires of you. You say you feel that your spirit often wavers and falters at the challenges you confront. Emblazon these defiant words of Nietzsche on your shield: That which cannot destroy me will only make me stronger. Hey Howard, you're going to get the whole world re-evaluating it's life and restrictions. That's great. We do restrict ourselves, imprison ourselves mentaly.We look for certainty in a world that can only garantee uncertainty. Maybe that's why Alan Watts titled one of his many books "The Wisdom Of Insecurity." I have to say, if that is true, then I must be a very wise person. Yes, the first truth of Buhda: "Life is difficult, once you understand this, Life is then Easy". I dont think it's a "Buhda Truth", I think it's just "the truth". Howard what are you eating? How are you sleeping? what's it like having 24hrs of daylight? when the others join you for the kite-ski bvack, how will they get there? Ski-plane? Helicopter? Parachute? We closed the workshop for the 3 week break today, only have to go back on wed 18th Jan. Had fun on my 25 year old 1000cc water-cooled 4cyl BMW a couple of weeks ago. The first time in 35 years of motorcycling that I have driven continuously on tar at over 200kph, and on the dirt roads between Loxton, Fraserburg and Sutherland at over 160kph. Imagine a little boy at the Funfair. . . . .The brochure for the self-catering Cottage said "Situated in the middle of the Karroo. Miles from public roads and people. It was so isolated that there are no keys for the place. You find it going through the sheep gate exactly 14,9 km after leaving the farmhouse. What the internet site and farmer did not mention, was this beautiful thatched stonbe cottage was directly under the North-Bound flight path for European passenger flights. From 5.30 in the morning to 11.30 at night they roared over-head. Do you think that spoiled my weekend? Safe walking Howard, X-mas at the pole. Best rgds Doug. Ya,cant always get what you want.Good mileage.Enjoy how you descibe the simple things of the day.Most take it for granted. Great description of freedom & prison. In 2004, after leaving a very successful and diversely adventurous business life, Howard made a radical move to pursue his dream of ‘Simply Adventure’, a simple wandering way of life, centred around sailing, cycling, and sea kayaking adventures, and one far removed from the capitalist and material world. In 2009, after years of solo sailing across the oceans of the world, and cycling the continents of the world, he moved his focus to Polar adventure. In 2010, together with three others, he completed an unassisted trek from Canada to the Geographic North Pole, joining an elite group of fewer than 60 people who have done this, one of the most difficult challenges on the planet. In doing so he became the first South African and at the time the oldest person ever to do it. His love for the purity of the solo adventure challenge has drawn him now to Antarctica and the South Pole, where he is attempting to become the oldest person, and first South African, to do the trip solo, unassisted and unsupported. Day 31: Closer and close, but not easier! Day 30: Let free, and a great day's skiing! Day 26: A Cold windy day... 31.5 km though! Day 24: A much needed Good Solid One! Day 19: Another Amundsen one... That's nice! Day 13! The first uneventful day... Rest! Day 11: Good news: I've got my sled back! Day 9: A big one! My route to The Pole: Messner Start. 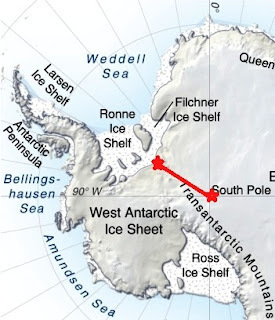 on 20th November 2011, Howard is scheduled to fly to a point 82'10"S 065'00"W on the Ronne Ice Shelf just off the Weddell Sea. This is the official, 'edge of continent', Messner start point, named after the famous Italian mountaineer and explorer, Reinhold Messner who in November 1989, almost accidently established this start point and the route to the Pole. Leaving the Ronne Ice shelf, the route skirts the western edge of the massive Foundation Ice Stream and the Transantarctic Mountains, climbing gradually to reach the South Pole at 9300 feet (2835m). Being only 900 kilomteres, this is a shorter, steeper, less traveled and more committing route that the more popular ones following Scott and / or Amundsen expedition paths, from the Ross Ice shelf. The conditions are hard and icy at the start,and there is always the danger of deadly crevasse, hidden by snow bridges. Sasstrugi, sharp irregular grooves in the snow, are hit or miss for most of the trek but tend to reduce in the last stretch of the trip, which becomes true ice desert wilderness. 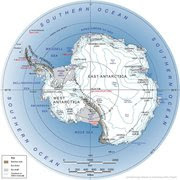 The low pressure in the South Pole can make the altitude feel more like 12,000 or 13,000 feet, which makes the physical exertion challenging. Howard anticipates taking somewhere between 30 and 35 days to reach the Pole.